The year 2018 is almost over and 2019 is just around the corner. 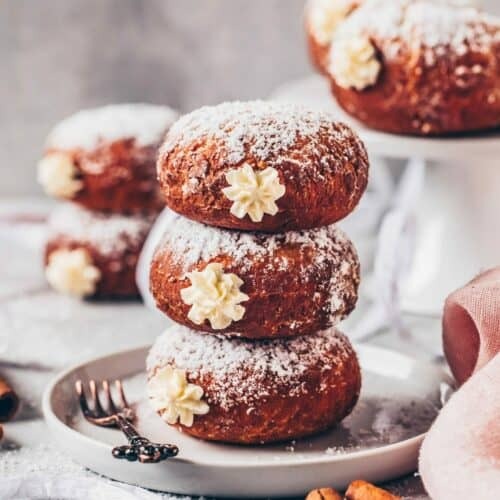 When celebrating New Year’s Eve, these delicious stuffed Vegan Donuts should definitely not be missing! 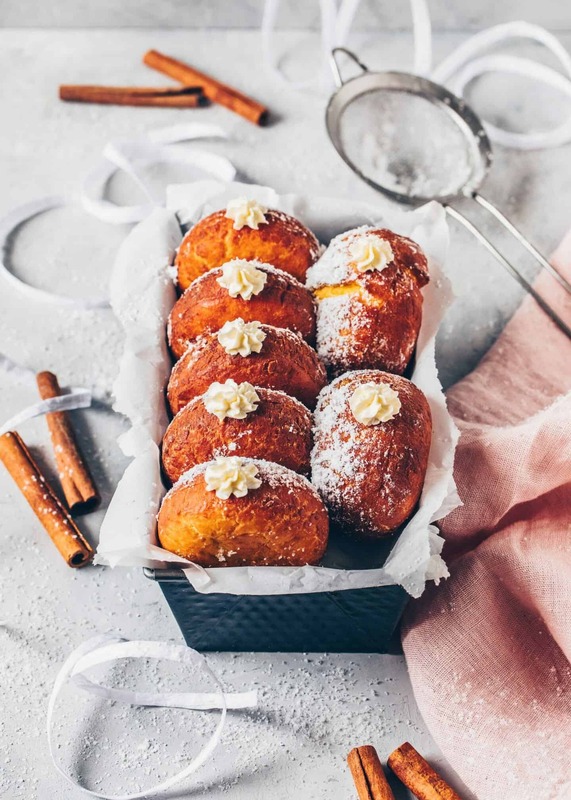 Anyways, I’ve wanted to share a simple recipe for Vegan Doughnuts on my blog for a while now, and I think that this is the perfect time to do it. These Vegan Pumpkin Doughnuts are fluffy and soft, also, they’re still moist and not dry thanks to the pumpkin purée. 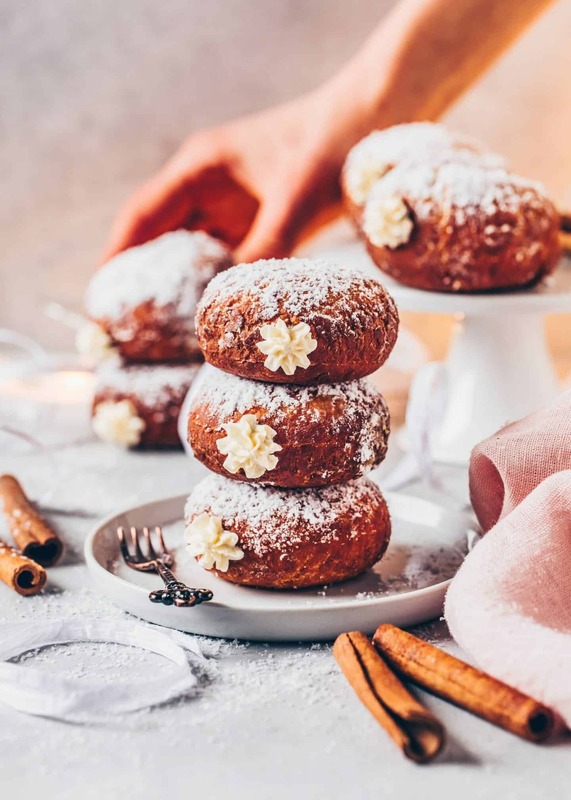 They’re spiced with vanilla and a little cinnamon making them incredibly delicious, plus they’re fairly easy to make! Pumpkin Doughnuts or Vegan Donuts? I’m always struggling with the right name for these yeast Dumplings. Some people call them filled Vegan Donuts, but there are also people who call them filled Vegan Doughnuts. 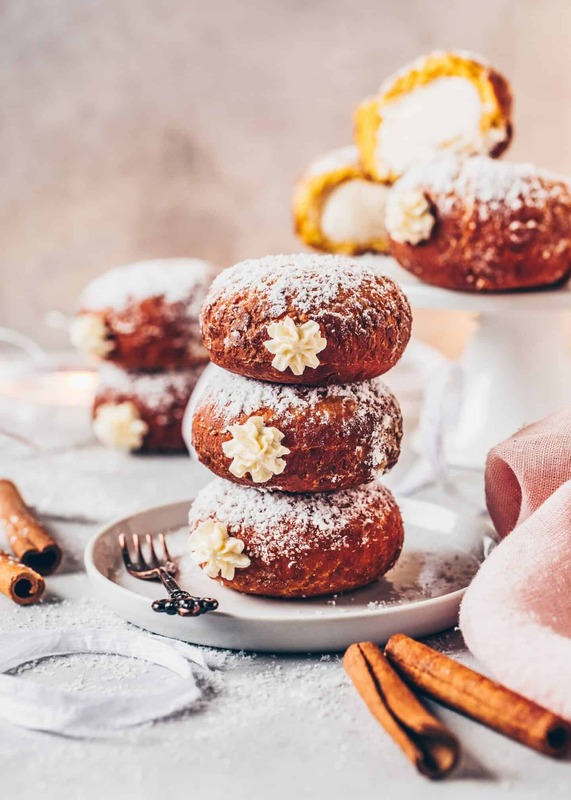 In Germany, however, they’re known as “Berliner Pfannkuchen” or “Krapfen”. Anyways, no matter what you call them, they are still pretty similar. 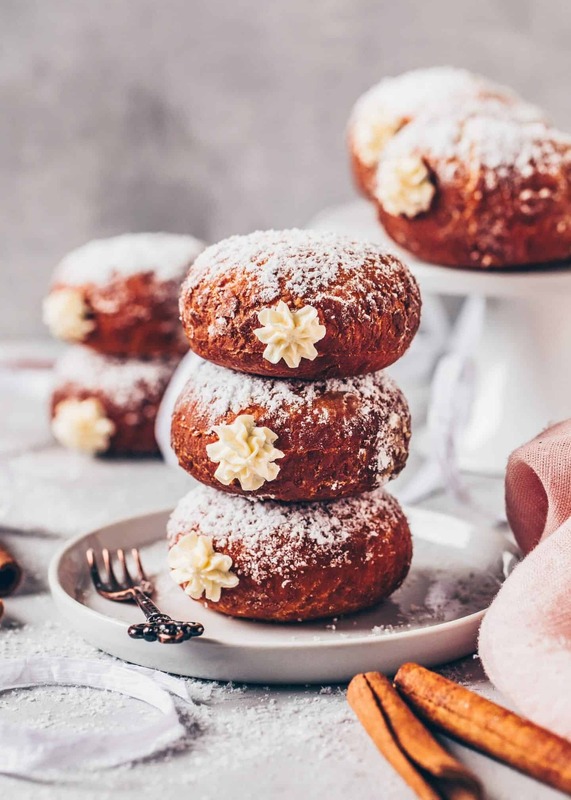 This sweet treat is made of a yeast dough that is traditionally deep-fried in hot oil and often filled with a delicious filling such as jam, chocolate cream, vanilla cream or other fillings. 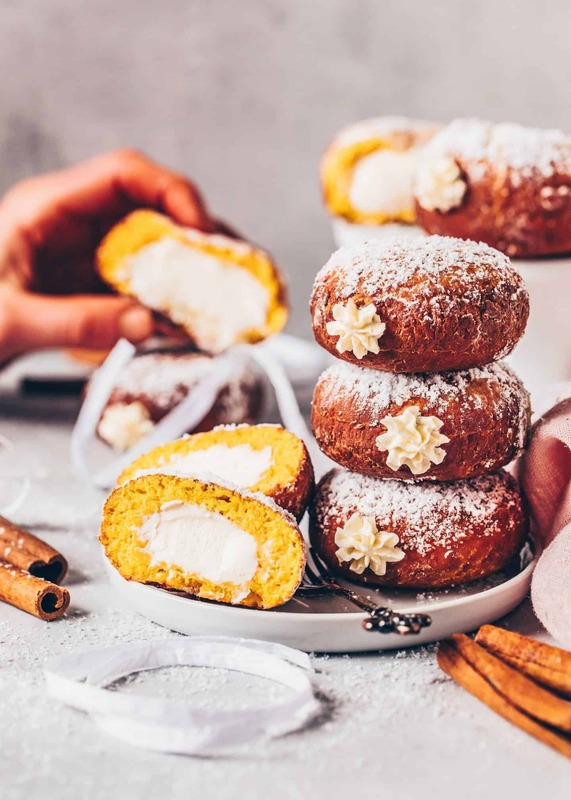 My version, however, is healthier than the classic Doughnuts because you can also bake these Pumpkin Doughnuts in the oven. Incidentally, Donuts are very popular because they taste absolutely delicious, so there’s always a reason to celebrate it when you serve them. If you’ve ever thought Vegan Doughnuts are hard to make, I can assure you, they most certainly are not! 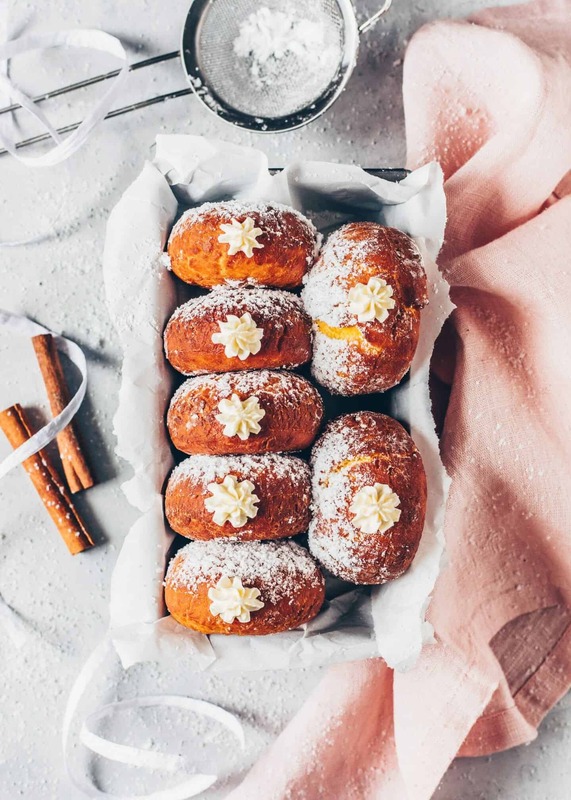 These Vegan Pumpkin Donuts are actually quite easy to prepare (apart from the waiting time). First, I always start with heating up non-dairy milk and vegan butter until lukewarm, then add a tablespoon of sugar plus a little flour and yeast. Stir to combine and let sit for 10 minutes. In a large bowl, combine remaining flour, soy flour, sugar, vanilla, and cinnamon. Gradually add the yeast mixture and knead with the dough hooks or with your hands until a sticky dough forms. I recommend adding just enough flour until the dough is not so super sticky because it should still be soft. Finally, form the yeast dough into a ball, place in a greased bowl and then let it rise covered for about one hour or until the size has doubled. 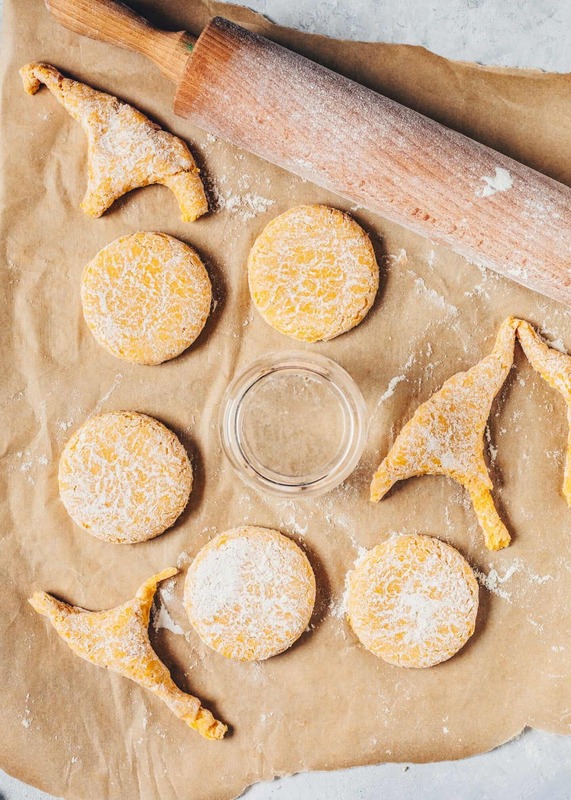 After that, you can roll out the yeast dough and cut out rounds using a cookie cutter or jar. Place on a parchment paper lined baking tray and cover to let them rise again for 30 minutes before ready to cook. 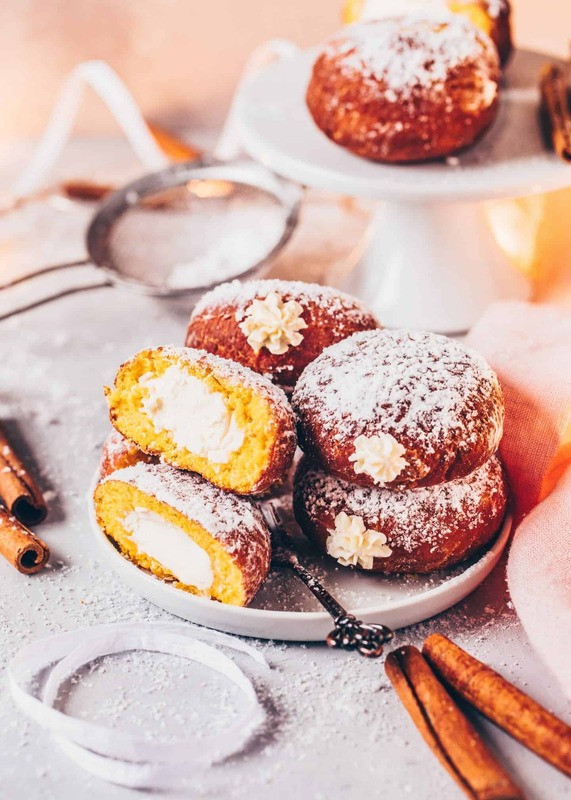 As mentioned before you can either bake these Pumpkin Doughnuts in the oven or deep-fry them. The fried version is more delicious and reminds me more of Pumpkin Cinnamon Buns. Although, baked Doughnuts are healthier because they contain less fat. However, if you want to give yourself a delicious treat and don’t care about some extra calories, please make sure that the oil for frying has the ideal temperature of 175 degrees Celsius (350°F). Otherwise, your Vegan Pumpkin Doughnuts will probably get browned outside very fast while the dough on the inside is still raw. When these Yeast Dumplings are golden brown outside and soft and fluffy inside, they’re perfect! Can be Baked or Fried! Perfect for New Year‘s Eve! If pumpkin or squash is not in season or available where you live, you can use canned pumpkin purée instead of making Homemade Pumpkin Purée. You could also use Sweet Potato Purée, 65 g applesauce, 1 small mashed banana, 100 g of quark or 2 egg yolks (if you’re not vegan). However, this recipe will also work if you only add additionally 25 ml of non-dairy milk. I usually use this plant-based cream for whipping but coconut cream will do too. 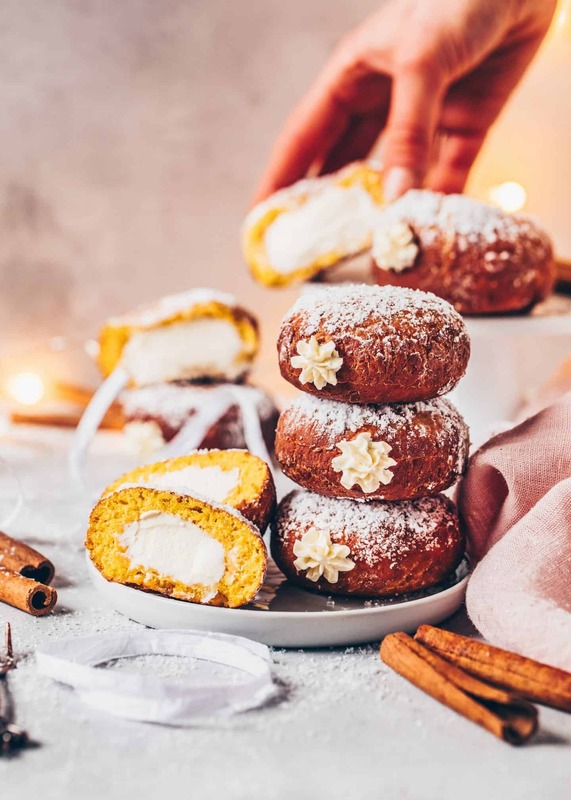 Instead of this Vanilla Cream Filling made with dairy-free cream cheese, you could also substitute tofu, nut butter, vanilla custard or soy quark. 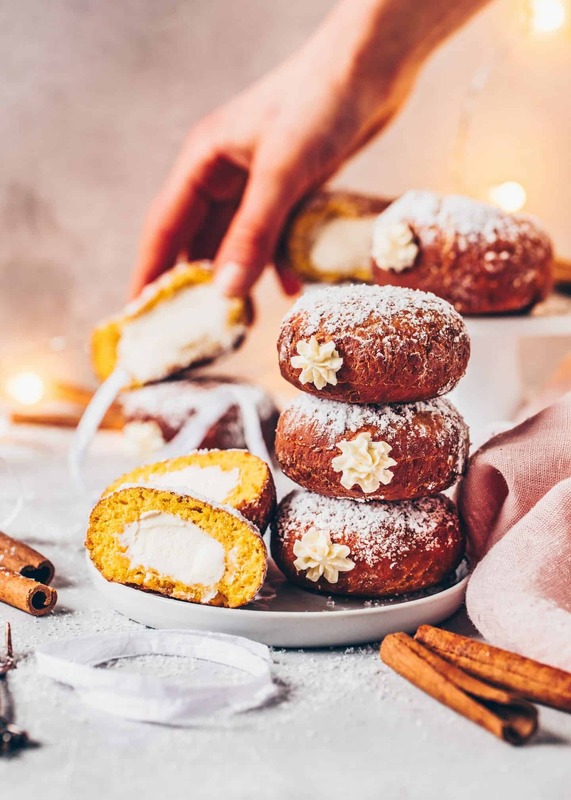 An easy recipe for Pumpkin Doughnuts (Stuffed Vegan Donuts) with vanilla cream filling. They are soft, moist, delicious and can either be baked in the oven making them healthier or deep-fried. Perfect for New Year's Eve, Carnival or any other days. Prepare Pumpkin Purée according to this recipe preferably in the oven (or use canned pumpkin purée or another substitute, read the text above). Heat the non-dairy milk along with the vegan butter in a pot until lukewarm. Transfer to a measuring jar. Add a tablespoon of the sugar, a tablespoon of the flour and the yeast and stir to combine. Rest in a warm place for around 10 minutes or until the yeast froths. In a large mixing bowl combine the remaining flour, soy flour, remaining sugar, vanilla, cinnamon, and salt. Add pumpkin purée and gradually pour in the yeast mixture, and mix using a stand mixer with dough hooks (or a kitchen machine or simply knead with your hands) for about 6 to 8 minutes, or until a smooth sticky dough forms. If the dough is super sticky, add a little more flour. Place the dough in a lightly greased bowl, cover, and place in a warm spot to rise until doubled in size, for about 1 hour. Turn out the dough on to a floured surface and using a rolling pin roll it out to around 0.7-inch (1.5cm) thick. 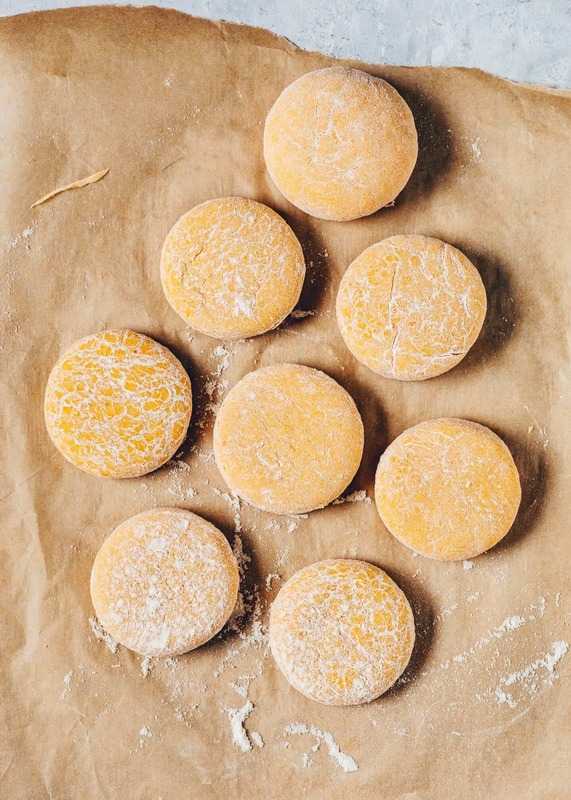 Using a round cookie cutter or jar, cut out the doughnut rounds and place on a parchment-lined baking sheet, leaving space apart. Cover and let rise again until puffy, about 30 minutes. Heat the oil in a heavy-bottomed pot or deep fryer to 350°F (175°C). Carefully place 3 or 4 doughnuts in to the oil. Do not overcrowd the pot. Cook on one side for around 1 minute or until golden. Carefully turn over the doughnuts with a large spoon and cook the other side. Remove the doughnuts carefully and place on a kitchen paper for a minute to drain. Repeat with remaining rounds. 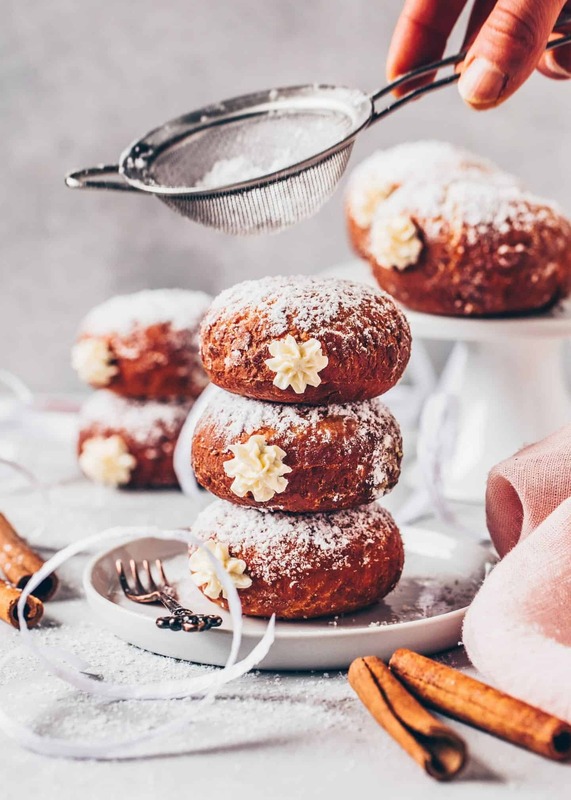 Toss the doughnuts in sugar and cinnamon or just dust with powdered sugar. Brush the top of the Doughnuts with melted butter. 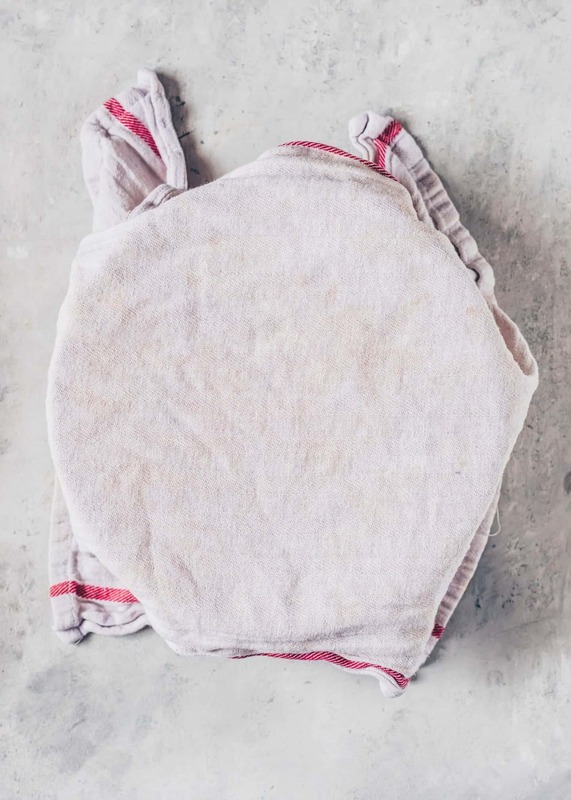 Sprinkle a baking tray (or a flat baking dish) with 2-3 tbsp of water. Bake for about 15 minutes or until risen and dark golden. Rotate tray during baking if needed to get color all over. In a medium bowl using an electric mixer, beat whipping cream, sugar, and vanilla until light and fluffy. In another bowl beat the non-dairy cream cheese until creamy, then fold in the whipped cream. Fill the cream mixture to a piping bag fitted with a long filling tip. Insert the tip into the side of a doughnut and squeeze the filling inside to fill. Repeat for the remaining Doughnuts. To make this recipe gluten-free you can sub a gluten-free flour blend. To make this recipe sugar-free you can use a sugar substitute based on erythritol or any other types of sugar. 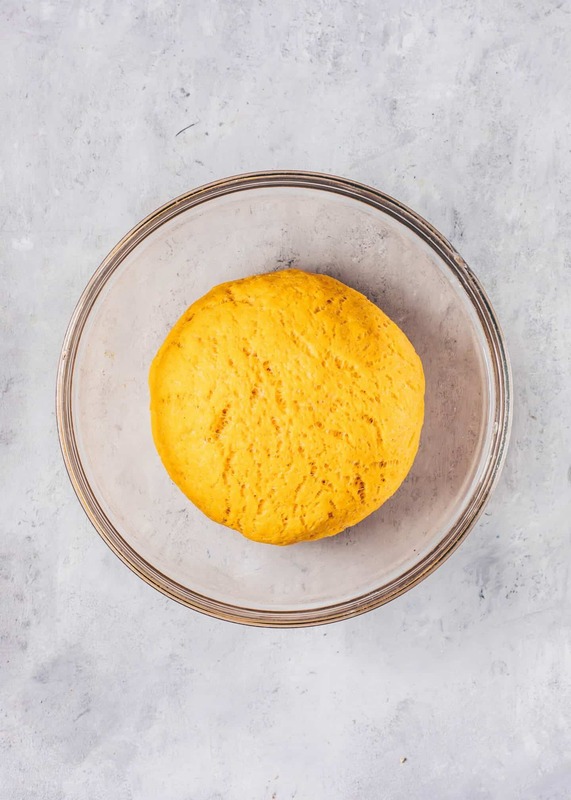 Recommendations how to substitute pumpkin purée or non-dairy cream cheese and plant-based whipping cream can be found in the text above this recipe ("how to modify this recipe"). Doughnuts last covered in the fridge for up to 3 days, but they’re best served the day they’re made. You can reheat them in the oven for a few minutes making them soft inside again but take note that they’ll get crunchy outside.